When was the last time you thought it would be a good idea to take your Skilsaw to concrete cutting applications? At first glance, this might seem like a rather amateur question. The game is changing though and the new Skilsaw MeduSaw Concrete Worm Drive is going to change the way you look at concrete cutting. It’s clear from the name that Skilsaw’s designed this with the worm drive they’re making their re-branded name on with products like the Worm Drive Table Saw. But it’s much more than just a good saw with a concrete blade on it. 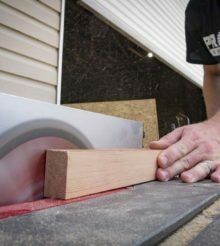 Skilsaw has addressed several major concerns when it comes to taking a circular saw and creating a concrete saw. The Skilsaw MeduSaw solves the issue of friction on hard surfaces with an integrated rolling foot plate and front pointer with rubber wheels. They ensured wet environment durability with with rust-resistance brackets and fasteners. From there, they designed a wet dust management system and included GFCI protection. There’s a vacuum port integrated on it for dry dust collection. Skilsaw’s Cut-Ready adjustable plunge lock will allow you to make consistent and accurate plunge cuts. The Skilsaw MeduSaw is going to be seen first at World of Concrete in January, but we were able to get our hands on an early sample. We’re in the process of reviewing it right now and will have some more ideas of what you can expect shortly. At first look, the MeduSaw is a really compelling product that’s taking into account the new OSHA rules on silica dust collection. It certainly seems like a well-designed unit and the fact that they’re putting out a hand-held concrete cutting saw for consideration as a serious professional level tool should raise some eyebrows. While we certainly don’t expect this to come anywhere close to replacing power cutters in concrete applications, the 7-inch MeduSaw should be a solid supplement when those larger tools are simply more cumbersome than the job requires. Of course there are other handheld saws on the market designed to cut the same materials, but this model from Skilsaw looks to be more capable than its competition. We’re short on specific details as far as specifications go, but we do know the expected retail price is $399. As we get closer to the launch at World of Concrete, keep your eyes open for more information. Waiting for the MeduSaw to come out? Check out what else Skilsaw has at Acme Tools while you’re waiting!